In this article you will find all the information about getting paid for your work as a translator with us. Gengo's translator rewards differ across language pairs and are based on several factors, including baseline rates in the industry and our translators' cost of living. The rewards total for each online translation job is displayed on the job details page and this amount will be automatically added to your reward balance when the job is approved by the customer. Rewards for offline jobs are added to your reward balance by the 4th of the month after the month during which the job was completed (i.e., submitted to and approved by the customer). Hang on, what’s an offline job? An offline job is any job that's not on Gengo’s online platform. Some jobs are assigned offline because they have special requirements (for example, translators must have CAT tools). We pay translators via PayPal or Payoneer in US dollars ($USD). PayPal is the default payout method. If you don't change any settings, you will be paid to PayPal, to the email address you are using on Gengo, whether you have a PayPal account or not (in which case, your payout will likely fail). In order to successfully receive your payouts via PayPal, you need to make sure your PayPal email address is the same as your Gengo email address and that you have a fully functional PayPal account with no pending issues. You can change your Gengo email address to match your PayPal account in your Account settings page. Alternatively, since PayPal allows you to have multiple email addresses associated with one PayPal account, you can add your Gengo email address to your PayPal account. To do this, simply log in to PayPal and click on the "Settings" button on the top. Once your Gengo and PayPal accounts share the same email address, you should also make sure PayPal is already your payout method in Gengo. You can do this from your Account settings page, under "Payout preferences." PayPal should be selected by default. PayPal fees: For details on applicable fees, click on the Help tab at the top of your account page, and then select the “What are the fees for PayPal accounts?” question on the right (see image below). Go to your Gengo Account settings page, under "Payout preferences" choose "Payoneer" and click "Update." The registration page below will be launched. Follow the instructions to fill in the necessary information, and make sure to enter the same email address you use in Gengo. You will be required to agree to Payoneer’s fees before you commit to sign up and create your account. Make sure you review them by clicking on the links (see image below) and reading the Terms and Conditions, as well as Pricing and Fees, thoroughly before agreeing to them. When it’s completed, you will see the screen below. You will receive an email confirmation from Payoneer within the next several business days. About 80% of applications are approved automatically, and the remaining 20% goes through a manual review process which takes between 1-3 business days. Payoneer may ask you for more information. Your Payoneer account is not active until your account is approved. If under review, please do not request a payout. More info here. Once your application is approved you will receive an email confirmation and can begin receiving payments. If you have a Payoneer account with a different email address to the one you use in Gengo, you can change your Gengo email address to match your Payoneer email address in your Account settings page. Alternatively, you can change your Payoneer email address to match your Gengo email address. To do this, simply log in to Payoneer and click on the "Settings" button on the top, then "Update Profile." You will need to enter your password, and then you can add your email address associated to your Gengo account. Once your Gengo and Payoneer accounts share the same email address, the second step is to set Payoneer as your payout method in Gengo. 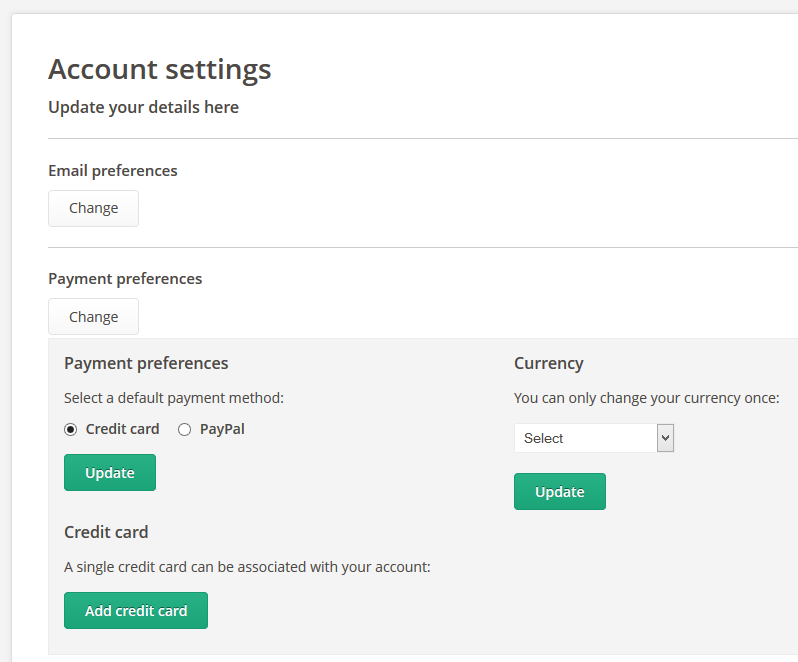 Go to your Gengo Account settings page, under "Payout preferences" choose "Payoneer" and click "Update." A registration page will be launched when you click the "Update" button. Now you should be all set to request a payout! Before actually requesting a payout, you'll need to make sure your brand new Payoneer account is available and ready to receive payments. Please go to your Account settings page, and your "Payout preferences" should look like this. If you see any of the screens below, it will mean that your Payoneer account is not available yet. You need to click on the “Update” button to complete registration. In some instances, Payoneer may need to review your account before your registration is complete. If you see the screen below, it means Payoneer is reviewing your account. You will need to wait for a confirmation email from Payoneer before you are able to request a payout. After you receive your rewards in your Payoneer account, you may want to use them in different ways. The Payoneer virtual account offers you the option to keep your rewards ready to use for online payments, withdrawing to a bank account or to a UnionPay card, or ordering a Prepaid MasterCard®. You can find the option to withdraw money to your bank account in the top navigation bar in your account. Payoneer Fees: To review your fees after signup, login to your account, make sure you select the applicable option (Prepaid MasterCard® Card or account balance), click Help on the top right corner, and select “Pricing and Fees”. If you signed up to Payoneer via the previous Gengo integration (June 2017 - April 2018), please not that we will not be forcefully migrating your account. If you’d like to migrate to a virtual account, please don’t hesitate to contact Payoneer for assistance. To learn more about how Payoneer works and how to create an account, you can download this FAQ document in PDF format (available in English, Japanese, Spanish, Chinese (Simplified) and Chinese (Traditional). Payoneer has also compiled a selection of helpful how-to videos here. Go to your account dashboard and click on request payout in the left sidebar. Click on payout full balance. For PayPal, there is a transaction fee of 1.50% of your reward for each payout, with a minimum cap of $1.50 and a maximum charge of $20. For example, if you request a payout for $50, you will receive $48.50, or if you request a payout for $500, you will receive $492.50. If you are paid via Payoneer, there are no fees on Gengo's side, as Payoneer will charge fees to users directly, so please check their website for more details. You can request your payout any time from the 18th at 5:00pm JST (Japan Standard Time) to the 3rd at 5:00pm JST. You will get your payout on the 10th. You can request your payout any time from the 3rd at 5:00pm JST (Japan Standard Time) to the 18th at 5:00pm JST. You will get your payout on the 25th. Please note that the deadline is 5:00pm Japan Standard Time, and all the times mentioned above are also Japan Standard Time (JST). If you are in a different time zone, you may miss the deadline if you wait for 5:00pm in your local time, so make sure to check what time it is in Japan. You can do this here or here. But again, your payout amount will be updated on the deadline, so you don't need to wait until the last minute to request your payout and receive the full amount. Note: the payout will be processed to the email address you have at the moment you request your payout. If you change your email address after requesting your payout, it will still be processed to the old email address. So, again, please make any necessary changes before you request your payout. If you ever have trouble receiving your payout, please see this article for more details. Some countries have a limit for how much money you can receive via PayPal or Payoneer. If you are in one of those countries and you request a payout for an amount higher than the limit, the payout will fail. PayPal: payouts are split over $5,000. This means, for example, if you request a payout when you have $6,000 in your balance, you will receive two payments via PayPal: one for $5,000 and one for $1,000. Each payment will have a transaction fee of 1.50% of your reward, with a minimum cap of $1.50 and a maximum charge of $20. Payoneer: payouts are split if you have $5,001 or more. So, for example, if you request a payout when you have $6,000 in your balance, you will receive two payments via Payoneer: one for $4,980 and one for $1,020. As explained above, there is no transaction fees on our side, as Payoneer will charge fees directly (more info in their website). We've set the automatic split system to ensure that most of our translators can receive their payouts without any problems, no matter in what country they're in. Currently, translator payouts are available only in US Dollars. We offer multi-currency support for customers who purchase credits, but translator rewards will be paid in USD only. Are you sure? I found a setting to choose currency and credit card! The credit card option and multi-currency support, which you can find under "Payment preferences," are only available to purchase credits as a customer, not to receive a payout as a translator. For the time being, we only offer translator payouts via PayPal or Payoneer in US dollars.